People come from all over the world to visit Niagara Falls. While many of them arrive from nearby areas in Canada and the United States, some come from as far away as Japan and Australia and other points across the globe. Unfortunately, when visitors cross many times zones to arrive for their vacation in Niagara Falls, there is the very real possibility of jet lag. While jet lag can’t always be avoided completely, there are steps that travelers can take to minimize the effects. If your visit to Niagara Falls involves a flight of six or more hours, these are some ways you can help ensure that you’ll arrive fresh and ready to enjoy your vacation to the fullest. When you board the plane reset your watch and the clock on your phone to Niagara Falls time. This can help you acclimate to the time change before your flight even arrives. If you plan to sleep on the plane (and you should definitely attempt to) try to sleep at a normal hour according to the new time on your watch or phone. Even if you only sleep a few hours you’re on your way to getting used to the time difference. Always consult your doctor but some people have great success overcoming jet lag by using sleep aids. Melatonin is a popular choice as it’s a naturally occurring substance in the body that helps to trigger sleep. Other choices include prescription sleeping medications and over the counter choices. While these might not be right for everyone it’s a great idea to check with your doctor before your trip to see if one is right for you. The climate inside an airplane has almost zero humidity so you run the risk of dehydration very quickly. Be sure that you drink as much water as you can to combat these effects, as dehydration plays a major role in jet lag. Bring your own water bottle on board or ask the flight attendant for a cup of water at least every hour that you’re awake. On the same note, avoid drinking alcoholic beverages before and during your flight as this will just make the dehydrating effects worse. Even though you’re bound to be tired when you arrive in Niagara Falls, it’s important to maintain a schedule based on the local time. For instance, if you arrive in the morning eat breakfast and plan a day of light activities. Some people recommend a short nap but not one that’s long enough to interfere with a good night’s sleep later on. Consequently, if you arrive in the evening try to go to bed at what would be your normal hour, but on local Niagara Falls time. While you may not sleep the entire night it’s still the best way to get started on a sleeping schedule that won’t interfere with your trip. You’ll want to enjoy your Niagara Falls vacation to the fullest, and that means stopping jet lag before it starts. 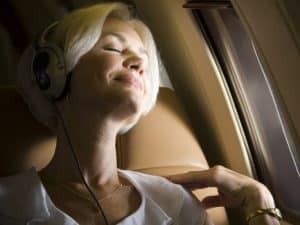 Try some of these tips if you’re traveling a long distance so not a second of your time is wasted on pesky jet lag.